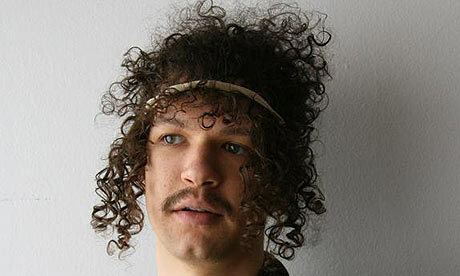 Albert Hammond Jr., Napoleon Dynamite... are all people that Darwin Deez is not. He’s a one man (or band, it’s still ambiguous) surreal explosion of pop joviality, on a mission to challenge your concept of what pop can be, and assault your happiness receptors is the meantime. Small but mighty experimental duo (usually a four piece) RAMS’ Pocket Radio was first up; bravely armed only with a drum kit, a keyboard, and no novelty gimmicks. Although they made a pretty impressive racket, with a bold and powerful sound and the ability to hold their own, they seemed a little out of place considering the line up. Perhaps investing in a couple more members and instruments would be a starting point. If you don’t manage to crack a smile at Darwin Deez, there’s probably something critically wrong with your sense of humour synapse, which is quite a mean feat, considering the repertoire consists majorly of songs with cheery topics such as heartbreak whilst jumping off an office building, heartbreak under the sea and heartbreak in post-apocalyptic New York. Since his/their show at The Club Academy last year, it’s clear that Darwin Deez’s appeal has reached the mainstream, many of the audience could have just as easily fitted in at the Devlin concert next door, but instead had opted to see a skinny New Yorker with a Jewfro flail his way through choreographed dance routines to Enya and play songs about Deoxyribonucleic acid love on an awkwardly tuned guitar. Radar Detector was the undeniable hit of the night, and it’s not hard to understand why – there’s nothing like a song where the ratio of clapping to drumming is pretty much equal to get a room of indie kids (or not) dancing. A close second was current single Bad Day, featuring the trademark combination of charmingly geeky but devastatingly sincere lyrics (in this case, about wishing a bad day upon an enemy for unknown reasons), magnetically catchy melodies and lashings of scratchy New York cool, whilst maintaining every song’s individuality. The Deez love wasn’t limited to Darwin either. For the first time, Andrew took the reigns, singing lead vocal on a new song and the odd rap battle proving that Darwin isn’t the sole driving force behind the Deez fun train. Just listening to the album is an injustice, the live show is were Darwin Deez comes into their own, as well as tweaking the odd lyric (The death toll in The Bomb Song has risen dramatically from 69,000 to 59 million since the recording of the album), you’ll be hard pushed to find another band where casually breaking into dance routines to the likes of The Spice Girls, or inter-band rap and dance battles is pulled off so naturally, and leaves you asking why no-one’s done it before. It could be something for Laura Marling or The National to consider. The sheer amount of dancing and audience participation meant the whole night was more reminiscent of the children’s entertainment at a family hotel than a gig. It’s not hard to see where the comparisons are drawn from; Napoleon’s geekiness and hair, Albert’s guitar solos and hair, but The Darwin Deez Experience is so unique it’s incomparable; so if you get the opportunity, throw your inhibitions out of the window, jump aboard the fun train and I defy you not to have fun. I’m sure Darwin would love it.